The Lake District is one of the most stunning mountainous areas in the UK. 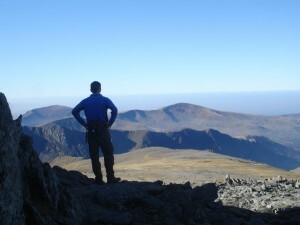 With breath taking mountains and valleys – it is the perfect backdrop to this epic challenge. This two day trekking challenge is a tough one involving 12 hours days in order to conquer all 24 peaks. 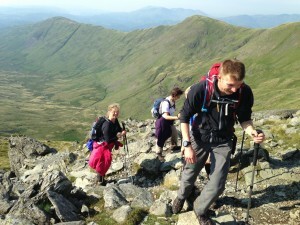 However the rewards of conquering so many peaks over a weekend will fill you with a huge sense of achievement. The trek is fully supported with qualified Mountain Guides and your accommodation & meals are included. All drinks and personal expenses. The easiest way to make your booking and our preferred method is online through the website, simply click the dates & availability logo. It is also possible to reserve your place over the telephone, by mail, or email. We cannot confirm any booking until we receive your fully completed booking form. Please get in touch with us via the contacts page or send us an email at info@adventurousewe.co.uk if you would like information on the 24 Peaks Challenge. Arrive late afternoon in time for an introduction and briefing about the weekend’s events. Overnight Hostel. The easiest way to make your booking and our preferred method is online through the website, simply click the dates & availability logo. It is also possible to reserve your place over the telephone, by mail, or email. We cannot confirm any booking until we receive your fully completed booking form. Please get in touch with us via the contacts page or send us an email at info@adventurousewe.co.uk if you would like information on the 24 Peaks Challenge.